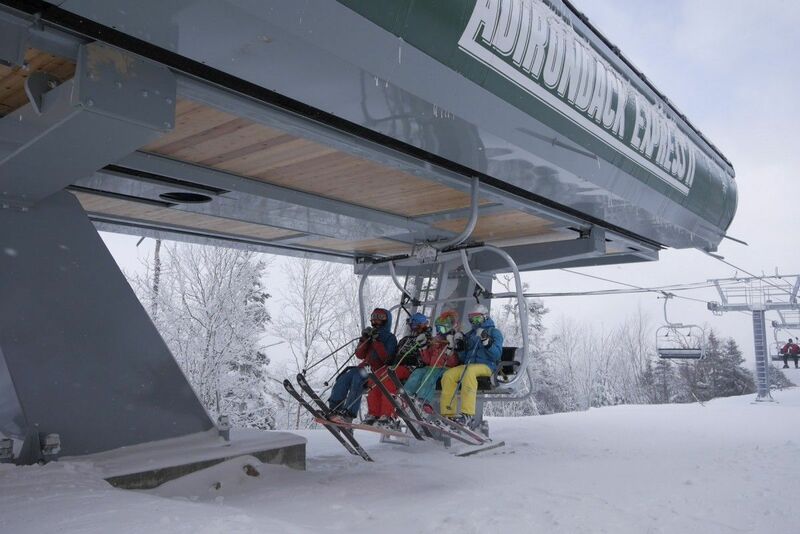 The Adirondacks Express II quad at Gore is new for the 2014-2015 season. Take a state-owned and managed recreation area, tuck it into the heart of one of America’s largest parks, give it funds to become a first-class ski resort and you’ve just met Gore Mountain. Gore and Whiteface in Lake Placid, site of the 1960 Olympics, are managed by ORDA (Olympic Regional Development Authority), a New York State Authority charged with making a profit from these two very different mountain resorts. Whiteface has the steeps, the ice and the glitz of its Olympic past, with a tourist-friendly base in nearby Lake Placid, a village with as many five-star resorts as Hummers on the Main Street. Gore, in the heart of the Adirondacks High Peaks about 1½ hour’s drive north of Albany (four hours from Manhattan or Boston; 2½ hours from Hartford or Montreal), has a total lack of pretension. Families come to Gore to ski, enjoy the outdoors and soak up the spectacular views of Adirondack State Park — at six million acres, the largest publicly protected area in the contiguous 48 states. Since its opening in 1934, the 3,600-foot-high Gore Mountain has been an innovator in snowsports: installing New York’s first gondola in 1968 and the region’s first high speed triple in 1984. Yet unlike many mountain resorts, from the peak of Gore you see forest — not condos, not parking lots, not airports. With laid-back crowds, a comfortable base lodge where you can still hang up a duffel with shoes and a brown bag lunch, 15 lifts, 116 trails carved from the most skiable acres in New York state, and 95% snowmaking coverage, families are guaranteed a fun day. The peppy new detachable quad serving the mid-station Saddle Lodge may be new, but the mountain has a safe, unrushed, almost old school atmosphere that few resorts with this quality skiing can match. Another unusual asset is the staff of committed locals. Because Gore is supported by the New York State agency ORDA, the mountain’s maintenance crew and ski patrol personnel are on staff year-round. In spring and summer, they repair ice damage to the facilities, clear trails and help on construction and expansion projects. One young teen we interviewed in the rental shop explained that he worked there every weekend to earn a season pass, his mom worked as a cafeteria manager, and his uncle ran one of the chairlifts. To our family, accustomed to meeting imported lift personnel coming from Mexico, Jamaica, South Africa and beyond at other resorts, having a knowledgeable local staff who were proud to be there was a nice surprise. The “More Gore” campaign over the last decade has expanded its management over Burnt Ridge, an adjoining mountain face, as well North Creek Ski Bowl, where the Ski Patrol was invented more than a half-century ago. Other expansion awaits environmental permits from the New York’s Department of Environmental Conservation. Families like the cute Northwoods Lodge, a renovated former gondola building redone by Lincoln Logs with the split log style of the region. It houses an expanded and very impressive children’s ski and ride school, a large Bear Den Nursery, a Burton Women’s LTR snowboard school, and rental equipment for all ages. The mountain’s convenient parking enables parents to pull right up to the Bear Den Nursery and help children get inside before moving their vehicle. On mountain, parents appreciate the gentle Ruby Run trail that allows beginners to cruise from the top of the gondola to Sunway down a 2.2-mile-long green circle run. Another fun trail, Twister, was carved out of glade to increase mid-mountain access to beginners and intermediates. More than 200 instructors lead group and private lessons in skiing, snowboarding and telemark skiing. Children’s and adult learning includes a snowsports school for ages 4-12, with its own slopes, 100-foot-long magic carpet and isolated learning hill outside the new lodge. Families can check in their children for two-hour increments or the full day program; fortunately, helmets are required of all participants. The Gore Kids Mountain Adventure Program pairs kids who sign up for 6, 10 or season-long learning sessions with the same instructors. Visiting novices are offered beginner packages for ages 13 and up that include discounted rentals and lift tickets, and most weekends from mid-December to mid-April fun, free family events are held at the resort. Visitors of all ages who come over the Christmas and Presidents Day weeks will find three-day Holiday Camps. The Bear Cub Den nursery cares for children aged 6-months to 6-years all winter, and those who want to start little ones off in the snow may arrange private lessons in conjunction with the daycare program. The skilled staff supervised infants and toddlers on a variety of Playskool and Fisher-Price climbing and play equipment, while others nap in porta-cribs in a quiet zone. Parents are asked to provide snacks, lunch and diapers; childcare can be purchased in two, four, eight-hour or week-long increments and some of the childcare staff will babysit for clients after hours. Our family decided that if we were going to stay a half-hour drive away from the slopes, we would splurge on a true Lake George classic, The Sagamore (866/384-1944; 110 Sagamore Road, Bolton Landing, NY 12814). The National Historic Hotel first opened in 1883 to serve the elite from Philadelphia and New York — as well as those living on nearby Millionaires Row – by luring investors to develop an exclusive resort on private Green Island. The fireplace suite we had at the Sagamore (there’s the main historic inn and newer condo style units in lowrise housing) was tastefully decorated with classic birch bark furnishings, armchairs entwined with willow branches, lamps with milk can bases, centerbead wood paneling and landscape prints. It swept us back in time to 1892, when Theodore Roosevelt declared the Adirondacks a state park and his cronies lived in estates along Lake George’s Millionaires Row. Although our suite had a fully stocked kitchen, the main lodge’s enclosed Verandah lured us in as the sun set over the lake. After a relaxing drink, we took our suits down to the hot tub and pool, worked out any sore muscles, then headed back upstairs to a wonderful meal in the Northwoods style Mr. Brown’s Pub. Under a chandelier of moose antlers, we had a simple and well prepared chili, chicken wings and Caesar salad meal and were, at last, content. Turning in for the night, we were thrilled to see the reflection of a full moon off the frozen lake illuminating our room. The Sagamore is more than a crash pad; it offers a full spa, golf course, fine dining restaurant, lakefront beach and myriad other recreational facilities year round. Families will need to book ahead for all holiday weekends, when special events and programs for kids take place. In winter, the resort runs a complimentary shuttle service to Gore Mountain which made it a perfect base for us. Gore Mountain (Peaceful Valley Road, North Creek NY 12853) is well priced, with many value beginner programs and midweek discounts. Kids 6-years and under and skiers 70 and above ride free every day; other discounted junior lift tickets available, too. This is a scenically beautiful region for a long weekend away, but we admit, somewhat dull for the non-athletes in the family unless they’re happy to curl up with a Grisham novel or shop in an outlet mall. Most of the other nearby lodging choices have limited facilities. If your family is committed to getting in a full day on the mountain, book a vacation rental at the Summit at Gore Mountain (North Creek, NY 12853), one of the Adirondack style wooden townhouse complexes nearest the slopes. The small town of North Creek, 1 mile down the road from Gore, is home to a few condo developments, small shops including the ‘everything Adirondacks’ Hudson River Trading Company, and a few restaurants. The well known summer resort area of Lake George (25 minutes’ drive) has a variety of fast food restaurants, the factory outlet shopping mall that is highly regarded, and many of the region’s best value hotels. During our research, we found the Hampton Inn Suites Lake George (518/668-4100, 2133 Route 9, Lake George, NY 12845) offering large rooms with two queen beds, an indoor pool and hot tub, guest laundry facilities, and a complimentary breakfast for about $100/night. Most of the dining action is south in Warrensburg or beyond that, in Lake George. George Henry’s (3735 Main Street, Warrensburg, NY 12885) is very popular for an apres ski beer and a burger. Weather permitting, the Circle B Ranch (771 Potterbrook Road, Chestertown, NY 12817) offers winter sleigh rides on cozy horse-drawn sleighs or outdoor trail rides.